Game directions: Arrow keys or WASD to move. Left click to collect resources, craft and fight. 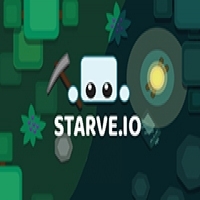 Starve.io Strategy Collect enough resource to craft a campfire. You can resist the cold for a while. Collect wood and stone to craft picks, swords and walls next to your workbench. Near the fire, craft seeds to plant them and survive hunger! Find gold and diamond resources to upgrade your tools !